The number of Christians in Germany decreased dramatically in 2016, largely driven by demographic changes, the German press reports. The number of Catholics and Protestants in Germany sank to a new low in 2016, with the latter hemorrhaging almost 1.6 percent of members in comparison with the previous year, according to recently released figures. According to the Evangelical Church of Germany (EKD), at the end of 2016 there were around 22 million evangelicals in Germany. Demographics played the biggest factor in the change: in 2016, approximately 340,000 evangelicals passed away while there were just 180,000 baptisms. Some 190,000 people left the church and just 25,000 people chose to join it, the German newspaper Die Zeit reported. A similar situation is seen in the Catholic Church, which lost 162,093 members last year, as reported at the German Bishop’s Conference in Bonn on Friday. However, the Church took solace in the fact that the rate of decline has slowed from the 181,925 loss that it suffered in 2015. While the number of people describing themselves as Christian declined, the number of regular churchgoers also decreased. In 2015, 10.4 percent of Catholics attended a weekly church service, which declined to 10.2 percent in 2016, or 2.4 million people. The Catholic Church numbered around 23.6 million followers last year, slightly more than the 21.9 million evangelicals. 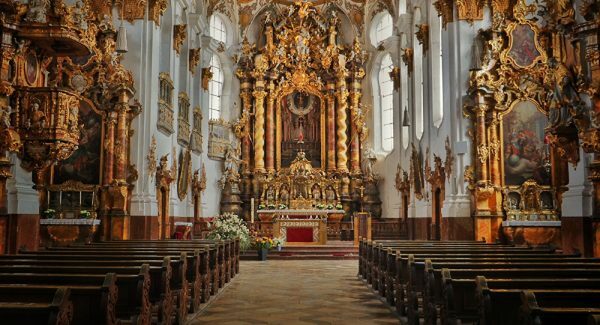 Including Orthodox Christians and other smaller churches, the proportion of German Christians was 58.3 percent. This figure has been steadily decreasing in recent years. In 2012, 62 percent of Germans were Christian and in 2013 the proportion was 61.6 percent. The statistics are worrying reading for Christian church figures. Commenting on the declining numbers on Friday, German Catholic Cardinal Gerhard Ludwig Mueller described the situation as “dramatic” not only in Germany, but in Europe as a whole. Europe is experiencing a “process of forced de-Christianization, which goes far beyond just secularization,” Mueller told an Italian newspaper, Domradio.de reported. While the number of Christians is dwindling, the number of Muslims is increasing. There are an estimated 4.7 million Muslims in Germany, a substantial increase compared with an estimated 3.8 to 4.3 million in 2011. According to the Pew Research Center, by 2050 one in ten Germans will be a Muslim and by 2070 at the latest, the global Muslim population will have outstripped that of Christians.